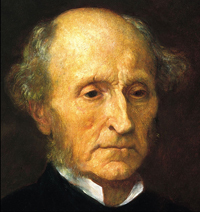 John Stuart Mill (1806-1873) was an English philosopher, political economist, and civil servant and has been called "the most influential English-speaking philosopher of the nineteenth century". 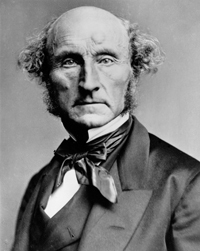 Born in 1806, in the Pentonville area of London, John Stuart Mill was the eldest son of Scottish philosopher, historian, and economist James Mill and Harriet Burrow. John Stuart was educated exclusively according to the rigorous expectations of his father, with the advice and assistance of political theorist Jeremy Bentham and Francis Place. He was deliberately shielded from association with children his own age other than his siblings. When not carrying out his administrative duties, James Mill spent considerable time educating his son John, who began to learn Greek at age three and Latin at the age of eight. At age eight, John started studying Latin, the works of Euclid, and algebra, and was appointed schoolmaster to the younger children of the family. By 12, he began a thorough study of scholastic logic, and reading Aristotle’s logical treatises. By the age of 14, John was extremely well versed in the Greek and Latin classics; had studied world history, logic, and mathematics; and had mastered the basics of economic theory -- all of which was part of his father’s plan to make him a young proponent of the views of the philosophical radicals. By his late teens, Mill spent many hours editing Jeremy Bentham’s manuscripts, and threw himself into the work of the philosophic radicals (still guided by his father). He also founded a number of intellectual societies and began to contribute to periodicals, including the Westminster Review (which was founded by Bentham and James Mill). In 1823, his father secured him a junior position in the East India Company, and he, like his father, rose in the ranks, eventually taking his father's position of chief examiner. This intensive study, however, had an injurious effect on Mill's mental health and state of mind. At the age of twenty, he suffered a nervous breakdown. In his Autobiography, he claims that this was caused by the great physical and mental arduousness of his studies, which had suppressed any feelings he might have developed normally in childhood. Nevertheless, this depression eventually began to dissipate, as he began to find solace in the Memoires of Jean-François Marmontel and the poetry of William Wordsworth. Mill did not study at the Oxford/Cambridge universities, as he refused to subscribe to the Thirty-Nine Articles of the Church of England. Instead, he followed his father, and went on to work for the East India Company until 1858. He attended University College, London, and went to hear the lectures of John Austin, the first Professor of Jurisprudence. He was elected Foreign Honorary Member of the American Academy of Arts and Sciences in 1856. In 1851, Mill married Harriet Taylor after 21 years of friendship. Taylor was married when they met and brilliant in her own right. She was a significant influence on Mill's work and ideas during both friendship and marriage. Mill's relationship with Harriet Taylor reinforced his advocacy of women's rights. He cites her influence in his final revision of On Liberty (1859), which was published shortly after her death. Taylor died in 1858 after developing severe lung congestion, after only seven years of marriage to Mill. Between the years 1865 and 1868, Mill served as Lord Rector of the University of St. Andrews. During this period, (1865-1968), he was Member of Parliament (MP) for the City and Westminster, and was often associated with the Liberal Party. During his time as MP, Mill advocated the easing of burdens on Ireland. In 1866, Mill became the first person in the history of parliament to call for women to be given the right to vote, vigorously defending this position in subsequent debates. Mill became a staunch advocate of social reforms, such as labor unions and farm cooperatives. In Considerations on Representative Government, Mill called for various reforms of the parliament and voting, especially proportional representation, "single transferable vote", and extension of suffrage. After his term in parliament ended, and he was not re-elected, Mill began spending more time in France, writing, walking, and living with his wife’s daughter -- Helen Taylor. On his religious views, Mill was an atheist. He died in 1873 of erysipelas in Avignon, France, where he was buried alongside his wife. Though Mill's influence waxed and waned after his death, his writings on ethics, and social and political philosophy are still followed. He influenced the shape of 19th century British thought and political discourse. His substantial corpus of works includes texts in logic, epistemology, economics, social and political philosophy, ethics, metaphysics, religion, and current affairs. None of Mill's major writings remain independent of his moral, political, and social agenda. Even the most abstract works, such as the System of Logic and his Examination of Sir William Hamilton's Philosophy, serve polemical purposes in the fight against the German, or a priori, school otherwise called "intuitionism". In his writings, Mill argues for a number of controversial principles. He defends radical empiricism in logic and mathematics, suggesting that basic principles of logic and mathematics are generalizations from experience rather than known a priori. The principle of utility -- actions are right in proportion as they tend to promote happiness; wrong as they tend to produce the reverse of happiness -- was the centerpiece of his ethical philosophy. On Liberty puts forward the "harm principle" that "the only purpose for which power can be rightfully exercised over any member of a civilized community, against his will, is to prevent harm to others." In The Subjection of Women, he compares the legal status of women to the status of slaves and argues for equality in marriage and under the law. A System of Logic (1843) is considered to be Mill’s most comprehensive and systematic philosophical work, which presented his thoughts on inductive logic and the shortcomings of the use of syllogisms (arguments derived from general principles, in which, two premises are used to deduce a conclusion) to advance deductive logic. In this work, he formulated the five principles of inductive reasoning that are known as Mill's methods. This work is important in so far as it outlines the empirical principles Mill would use to justify his moral and political philosophies. Theory of Liberty (1859) caused the greatest controversy of his career. It has since become a classic of liberal thought. Written and developed in close collaboration with his wife, Harriet Taylor, Mill addresses the nature and limits of the power that can be legitimately exercised by society over the individual. Mill states that it is acceptable for someone to harm himself as long as he is not harming others. He does argue, however, that individuals are prevented from doing lasting, serious harm to themselves or their property by the harm principle. Because no one exists in isolation, harm done to oneself may also harm others, and destroying property deprives the community as well as oneself. Mill further argues that despotism is an acceptable form of government for those societies that are "backward", as long as the despot has the best interests of the people at heart, because of the barriers to spontaneous progress. Mill's most significant impact was in promoting Utilitarianism. This philosophy argues that moral actions increase happiness, and thus the ethics of decision are determined primarily according to the decision's outcome -- this philosophical approach is sometimes called consequentialism. Although Mill's utilitarian ethics emphasizes happiness as a moral good, he was not a simple hedonist. The goal of an action is not just to maximize happiness for oneself, but for others as well. Stealing money from a wealthy man, for example, does not maximize happiness because it harms the victim of the theft. Mill emphasized that happiness could be gleaned from hard work and intellectual pursuits, and claimed that people could attain happiness regardless of their education or intellectual prowess. "… it is better to be a human being dissatisfied than a pig satisfied; better to be Socrates dissatisfied than a fool satisfied. And if the fool, or the pig, is of a different opinion, it is because they only know their own side of the question." Mill extensively wrote on what constitutes a good life. He argued that people should pursue simple pleasures that bring about true happiness, not just contentment. He argued that freedom and individuality were key ingredients in the recipe for happiness, and emphasized that the oppression of racial minorities and women limited their opportunities to achieve happiness. Mill believed that pleasure was a primary human motivator that could also be used to reinforce behavior. In his early years, Mill’s economic position was one of free trade and a utilitarian society. He did, however, favor government intervention when they supported utilitarian principles. Mill published the Principles of Political Economy in 1848, which quickly became one of the most widely read works on economics of its time. Later in life, Mill modified his work with a more socialist bias, arguing in favor of abolishing the wage system and replacing it with cooperative wage earning. The Subjection of Women is one of the last subjects of Mill’s well-known work in the history of feminism. Mill saw women's issues as important and began to write in favor of greater rights for women. In his article, "The Subjection of Women" (1861), Mill attempts to prove that the legal subjugation of women is wrong and that it should give way to perfect equality. He talks about the role of women in marriage and how he felt it needed to be changed. There, Mill comments on three major facets of women's lives that he felt were hindering them -- society and gender construction, education, and marriage. Mill is also famous for being one of the earliest and strongest supporters of ever greater rights for women. He felt that the oppression of women was one of the few remaining relics from ancient times, a set of prejudices that severely impeded the progress of humanity. Considerations on Representative Government -- Mill's major work on political democracy, Considerations on Representative Government, defends two fundamental principles, extensive participation by citizens and enlightened competence of rulers. 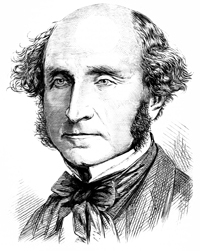 Mill believed that the incompetence of the masses could eventually be overcome if they were given a chance to take part in politics, especially at the local level. Mill is one of the few political philosophers ever to serve in government as an elected official. In his three years in parliament, he was more willing to compromise than the "radical" principles expressed in his writings would lead one to expect. Principles of Political Economy -- In 1848, Mill published Principles of Political Economy, which soon became the most important text of his time. The book examines the conditions of production, namely labor and nature. Following Ricardo and Malthus, he emphasizes the possibility of change and social improvement, and examines environmental protection needs. For these to be obtained, he considers a limitation of both economic growth and population growth, as the polis itself is indispensable. Furthermore, Mill argued in favor of worker-owned cooperatives, which clearly reflect his views.